Breaking News…the Los Angeles Lakers have finally done something right in free agency. It’s blowing up all over a trending Twitter right now. We’ve talked until we are purple and blue in the face about how the Lakers squandered all their big-man chances in just a weeks worth of NBA free agency, after drafting smart, selecting D’Angelo Russell with their second pick in last months new class of court session stars. It all fell apart in the regrets of passing up on Jahil Okafor in just a matter of days. From Marc Gasol to LaMarcus Aldridge and Kevin Love to DeAndre Jordan, with all the Jimmy Butler and Rajon Rondo positions in-between to boot. Then this weekend the Lakers finally acted, trading some future picks to the Indiana Pacers for the 7 foot 2 inch, blocking machine, big man Roy Hibbert. A good, albeit gamble of a move as this former All-Star is coming off a poorly productive season. So as of the last few minutes the Buss brass of the Lakers finally gave the gold and purple a move with real heart to be proud of. Clawing away ‘Sweet Lou’ Williams away from the Jurassic World of Toronto Raptor basketball, last years ‘Sixth Man Of The Year’ moves from the Canadian cold to the California sun. The Lakers now have a guard heavy rotation to beset their lack of big-men with last years best bench player sharing a position with Laker legend Kobe Bryant (they did say they where embracing the Curry hot, Golden State Warriors small-ball revolution). Not to mention a backcourt with young, dynamo, dynamic duo of the future in D’Angelo Russell and one of last years top rookies Jordan Clarkson. Surely now Jeremy Lin will take that Linsanity minute of New York fame back to the Knicks. But where does this leave the swag of the Lakers own Sixth Man candidate for last year Nick Young (still imagine this young, four guard rotation constantly scoring on you in this new small ball era changing of the guard)? Maybe P will be a package part of a trade for another big Laker target. Right now the only thing that matters is the Lakers have finally made a move that is worthy of their Big Game legend like James with their play for Young’s former Sixer teammate. Responding to critics and complacency alike. This three year reported deal for Louis is a slugger hit for a franchise that have struck out so much recently they even had former great guard Magic running for the bases of baseballs Dodgers in ownership. This Raptor ranch buy keeps them from critical extinction as they prepare themselves for a blockbuster like Chris Pratt. The Clippers may be the guardians of L.A.’s galaxy right now, but it looks like Hollywood’s original basketball team is adding more stars before our eyes and with Hibbert, Russell, Randle, Clarkson, of course Kobe and now Lou it’s making for quite a team right now that could run all the big men off the floor. Toronto Raptors owner, rapper Drake even wrote a song about this ‘6 Man’ on his recent mixtape. Aubrey Graham has even more reason to be emotional now, running through the 6 with even more woes. Lou Williams with the switch. If you’re reading this, it’s too late…he’s gone! UPDATE: Reports have come in saying the Lakers are set to sign free agent Brandon Bass from their former championship rival, the Boston Celtics. Fishing for Bass gives the Lakers one of the most durable and reliable big-men in the league with the 30 year old. A reeled in Power Forward that can tutor and mentor young big Julius Randle and give the Lakers more line-up options. Joining the equally good Roy Hibbert the Lakers now have a fully-loaded frontcourt that acts as the perfect compliment to the small-ball revolution of guards and wings that they where reaching for by not selecting Okafor. Plus with their lack of elite 7 foot signings in the first week of free agency market trading maybe it was all meant to be this way. Taking emphasis off the post and past. Their future belongs to their new number one, D’Angelo Russell. Dame Time Forever. What Are Those New Adidas ‘Black Panther’s’? Adidas are in the Endgame now. Before we get started, Havlicek would have stole that ball. Just saying Paul George. Stop acting like Paul Pierce. It wasn’t a “bad shot”. And R.I.P. to a Boston Celtic and storied NBA great. Dear John will be stealing every ball in hoop heaven. Rest peacefully. Like a cat toying with a mouse. 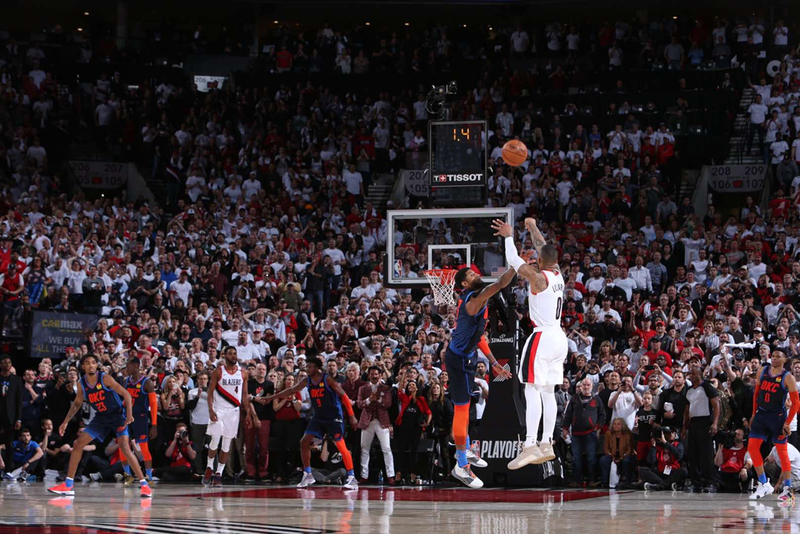 That’s how we described Lillard’s Dame Time winning clutch three from Mt. Hood as Portland gave Oklahoma City roses in the first round this week. Damian had more clock than grandfather’s and still took his time. Because it is his after all. And now as timely as ever in the same week as one of the greatest playoff game and series winning shots in basketball for all time and one of the biggest blockbusters in Hollywood history coming out with ‘Avengers: Endgame’, this cat is building a superhero legendary legacy. You better check a comic-book or something. 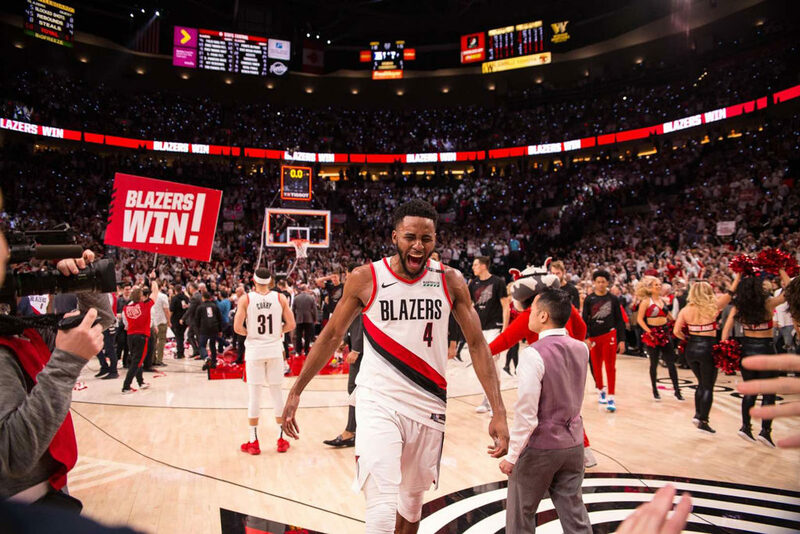 T’Challa may have been Thanos snapped to cat litter in the Avengers ‘Infinity War’, but the King of Wakanda has a regal gift by royal appointment to Damian Lillard like he did Victor Oladipo in a victorious Slam Dunk Contest for testament tributes last season. The cat has something out the bag. Now you may be screaming “what are those” like Shuri at these royal sandals, but try these sneakers on. They embody everything about the next gen, nano tech Black Panther suit she developed for this emperor’s clothes. All the way down to the texture and trim which straps “Wakanda Forever” over the laces. The titan mad purple that runs like veins through Chadwick Boseman’s superhero suit absorbs all the blows he takes and turns it into a recharged deflecting energy pulse. 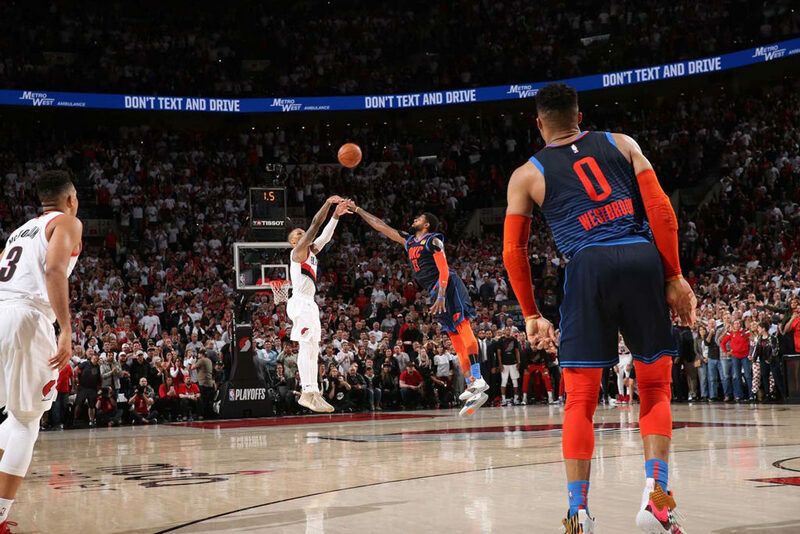 Kind of like all the rock the baby and wrist tapping crap Damian Lillard was taking off Russell Westbrook before he absorbed it all and gave it back in a half century energy that exploded with a game winning fireball. Marvel have also gifted Dame with his own Black Panther mask like Oladipo, but this time canvas created from his super sneakers. Part of the ‘Heroes Among Us’ series from the three stripes, a comic-strip advertising campaign has been crafted. Featuring Lillard standing in front of the downtown RIP City, PDX skyline looking Wakandan in artwork akin to the ‘Nation Under Our Feet’ graphic novel redux series that rebooted this classic character before his feature film debut. Damian may have played Killmonger villain to the Oklahoma Thunder, going G.O.A.T. like Michael Jordan B. But he’s a hero to us now blazing a trail like a human torch possessed with a fire and the heart of a lion inside all that panther power. The Dame 5 will assemble with the arc of the bolted up ‘Iron Man’ Harden Vol. 3 for James and the patch of the ‘Nick Fury’ TMac 1 for Tracy McGrady. As well as the ‘Captain America’ Adidas N3XT L3V3L, and a ‘Captain Marvel’ Adidas Pro Vision for all those who could take the lead all day, with us ’till the end of the line. HIGHER. FURTHER. FASTER. But we know which ones will be clawed off the stores shelf throne come it’s big blockbuster release with ‘Endgame’ right now. It’s a drip fit for a King. Must Read: What now for the Los Angeles Lakers?